Beetroot in a can was best left to my childhood with bad memories of white bread sandwiches and slices of canned beetroot. So it was with a bit of reservation that I tried this recipe as it involves two, yes two cans of beetroot but what a result. Creamy, earthy and salty - what a great combination. Process the canned beetroot and juice in a food processor until smooth. I left some chunks in mine. Add a little water if necessary and process until you have a pourable consistency. Reserve. garlic and thyme and fry gently until the onion is tender. Add the rice and fry, stirring, for 2 minutes. 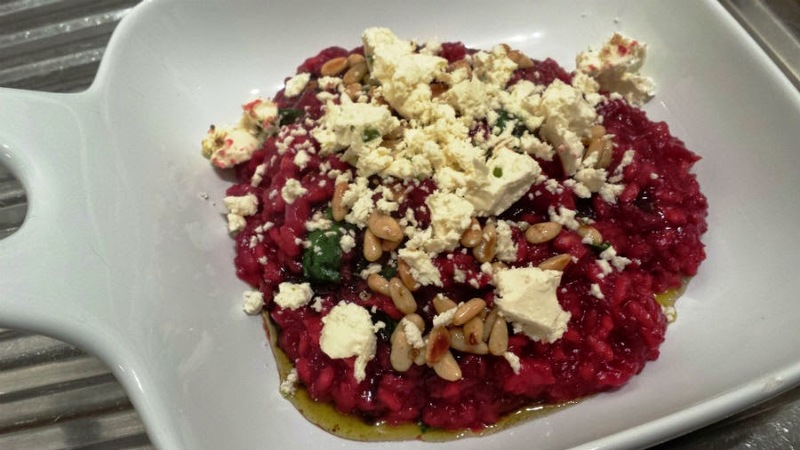 Add a ladle of the beetroot puree to the rice and stir until 2⁄3 of the liquid has been absorbed before adding another 100ml. Continue adding the puree, 100ml at a time, cooking until the rice is al dente and the risotto is moist but spoonable. If you need more liquid just use water. Add the red wine and baby spinach leaves and stir until spinach is just wilted. Season heavily with black pepper. Combine the pine nuts, oil and vinegar. 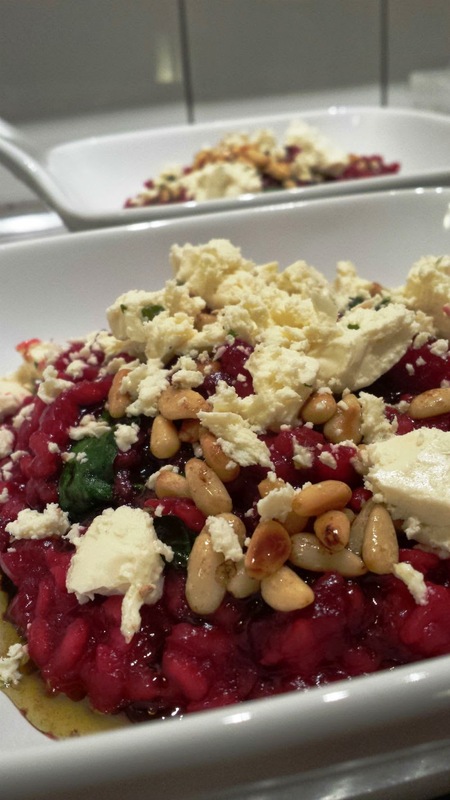 Serve the risotto topped with the nut mixture and crumbled feta. Enjoy!